I knew who Jeremy Collins was before I met him. You probably do, or did, too. You know that incredible drawing you saw in Alpinist magazine last issue? Okay, how about that cool map for the American Alpine Club? Okay, have you seen any hand drawn climbing art done in the last few years? Yeah, that’s probably Jeremy Collins. I was immediately impressed with his work. There’s something so special about the ability to capture a place’s essence in a more subtle way than a photograph, to me. I love photography – don’t get me wrong. But when you can convey complex emotional sentiments about a place with exquisitely drawn lines, shading, and coloring – to me that is really something special. At last summer’s OR show in SLC, I came upon the Meridian Line booth one day strolling the floor. I didn’t know at the time it was Jeremy’s company, but I immediately recognized the graphics on the t-shirts. Jeremy was there and we chatted for a little bit about his projects, my projects, etc. We talked about where he lived (Missouri), and what it’s like to have roots somewhere without much access to climbing (I’m no stranger to that, having spent tons of time in the Washington D.C. area where the nearest GOOD crags are 5-8 hours away). He never batted an eye. And this immediately struck me. Jeremy is really good at focusing on the positives, instead of the negatives, of his situation. Of course, as soon as I heard about Jeremy’s movie, Drawn, I wanted to see it. Somehow beneath a sea of other social media posts and climbing media, I forgot about it. I finally got a chance to watch it though, and I’m so glad I did. I think it’s the best climbing movie I’ve seen in a really long time – maybe ever? The story is focused around Jeremy going on expeditions in the four cardinal directions to spread the ashes of his good friend and mentor, the late Johnny Copp, on farflung remote peaks, via climbing first ascents that would be befitting of Johnny’s style. I have to admit, I began to grumble a little when the film started out and I picked up on the arc. I have pretty strong mixed feelings about this kind of narrative. I’ve had a few friends and quite a few acquaintances die in the mountains of late. I have even more good friends that I see pushing it really hard in the mountains, and I’ve begun to worry about them, too. From time to time, I have felt jaded by the idea of celebrating those who died in the mountains by encouraging others to put themselves in the same sort of risky situations – in other words, by selling the idea of alpinism, and focusing in the wake of trauma upon the notion that ‘So and So’ died doing what he or she loved. I think the issue is more complicated than that, and that it is somewhat problematic to present high risk climbing as a cut and dry worthwhile decision or lifestyle. I think that choice varies from person to person, from year to year of their lives. In our efforts to make light of a dark situation, I often worry that we push too hard the “worth the risks” side of the coin, while unintentionally creating a self-perpetuating cycle of tragedies. A screen grab from the movie. Jeremy shows THIS side of climbing in a pretty honest light, while longing for his family back home. So I began watching Drawn a bit on edge, and even looking for this kind of one-sidedness. But I am so happy to say, I really feel that Jeremy (along with James Q Martin, Tim Trabon, and whoever else helped largely in the film narrative) gives the subject its due complexity. Drawn is not just a stoke-filled pump-fest of summits shots and victory whoops. It’s a constant balancing act between Jeremy’s home life (the scenes with his wife and children I thought to be the best of the movie), and his desire to honor his dearly departed friend as well as his own penchant for adventure. No matter where he is on the globe, the narrative of Jeremy’s climbs always involves his family, his longing for them, his changing risk assessment in light of what he has back home. And whenever he is home, the film pays careful attention to the adventures to be found in the seemingly mundane task of raising two kids with his wife in Missouri. It sounds like the American Dream, on paper, but Jeremy fills this heartfelt lifestyle with so much light, enthusiasm, and love, that it comes off looking as enticing as the mountains themselves. Every climber walks the line between freedom and responsibility: freedom to climb whatever your hands and feet can get you up; responsibility to come home to the people who love you and invest time and energy into your life. It’s a balancing act, subject to chaotic forces beyond our control and with no clear rules or definitions of what is or is not acceptable risk. When the coin stands on its edge, you can see both sides of it. When it falls flat, one side gets covered up entirely. Balancing the coin of your own life on end is challenging enough. Paying a respectful tribute to a great friend that celebrates both how they lived, and how they perished, while showing both sides of the coin – that is a proud achievement. 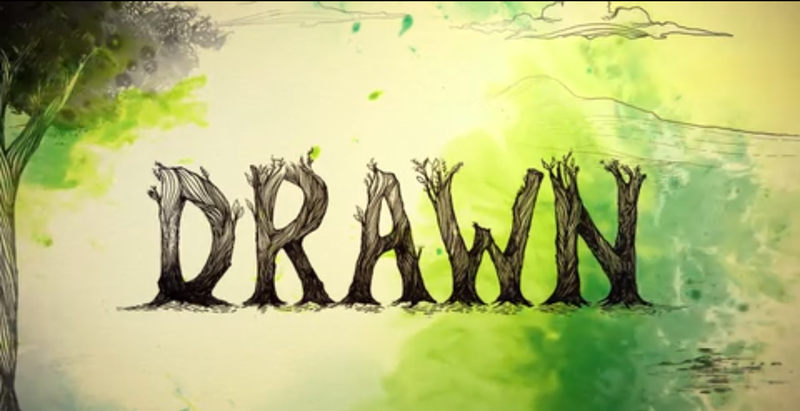 With Drawn, Jeremy Collins manages to succeed on both accounts – and that is truly remarkable. 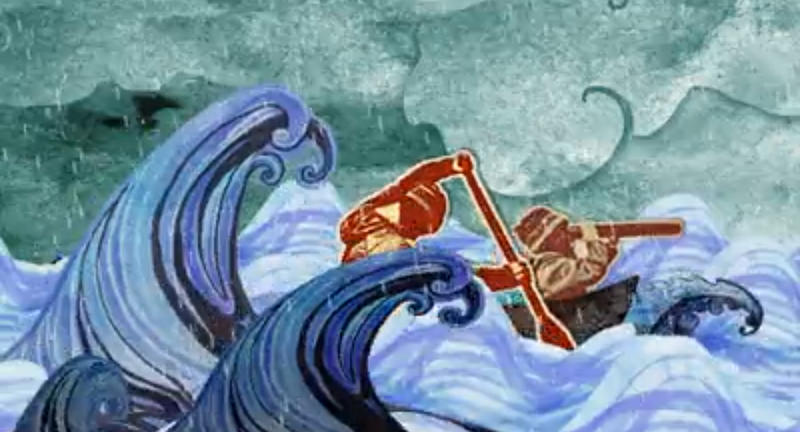 A screen grab from Jeremy’s beautifully illustrated dream with his son. You can see the film, Drawn, at jercollins.com. I didn’t even mention how incredibly beautiful the artwork and cinematography is. 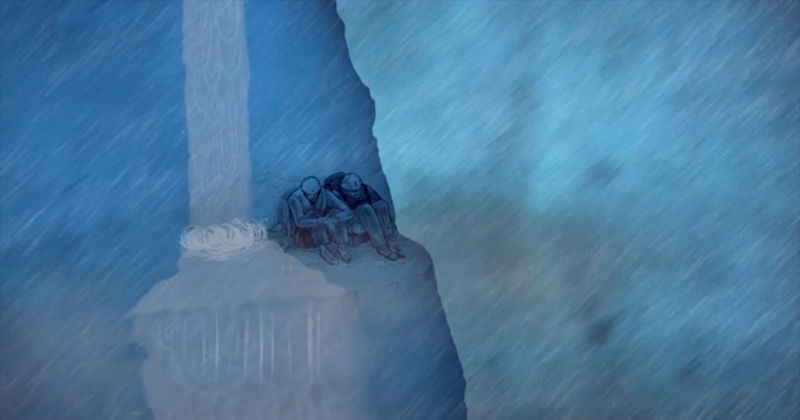 The illustrated scene of Jeremy’s dream with his son is so awesome, it alone is worth the small cost of watching the movie. Drawn is also soon to come out in book form, with a release date of May 15, 2015. Jeremy is currently on tour for that very book. You can see the dates for that tour here. Big thanks to Jeremy for letting me check out the film, and answering a bunch of questions I had that could all be found quite easily by clicking links on his website. Jeremy is awesome, his film is rad, and the book is sure to be badass. You can preorder right now at amazon.com If you aren’t already convinced, here’s a preview of the film to whet your appetite!